Never before has it been so important to have independent, honest voices and sources of information. We are – as a society – inundated with a flood of biased information. The mainstream media, concentrated in the hands of a few and owned by large multinational corporations, is filled with inherent bias and constant manipulation. That is why independent media is of critical importance now more than ever. Telling the truth is not a money making proposition however. We are currently running a monthly financial deficit which only goes to prove this. 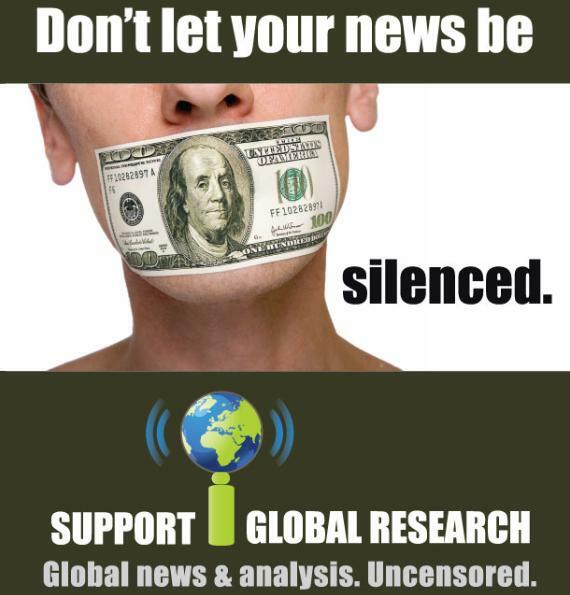 Please help sustain Global Research, which has come under increasing attack for relaying stories and accounts that counter what governments, major corporations, and the mainstream media are claiming and reporting. Global Research Needs Your Support! Please visit our MEMBERSHIP page to select your subscription option. Show your commitment to the truth. Help us connect with the world and show that we refuse to be deceived into war and tyranny. All new members (annual basis) as well as all membership renewals (annual basis) will receive a FREE copy (in PDF format) of “The Global Economic Crisis: The Great Depression of the XXI Century“, edited by Michel Chossudovsky and Andrew Gavin Marshall, as well as the new e-book (in PDF format) from Global Research, “Towards a WWIII Scenario: The Dangers of Nuclear War” by Michel Chossudovsky. All new members (monthly basis) will receive a FREE copy of the new e-book (in PDF format) from Global Research, “Towards a WWIII Scenario: The Dangers of Nuclear War” by Michel Chossudovsky. Help us remain independent, so that we can continue to fight the tide of misinformation about issues that matter to you.